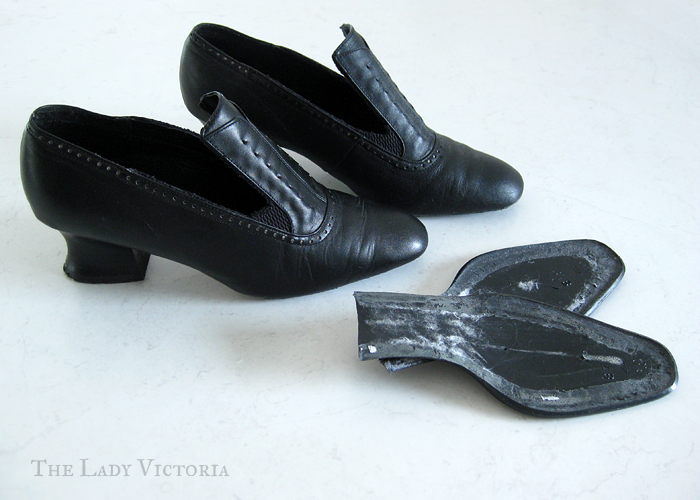 Ah shoes, the worst part of a costume to try and pull together. 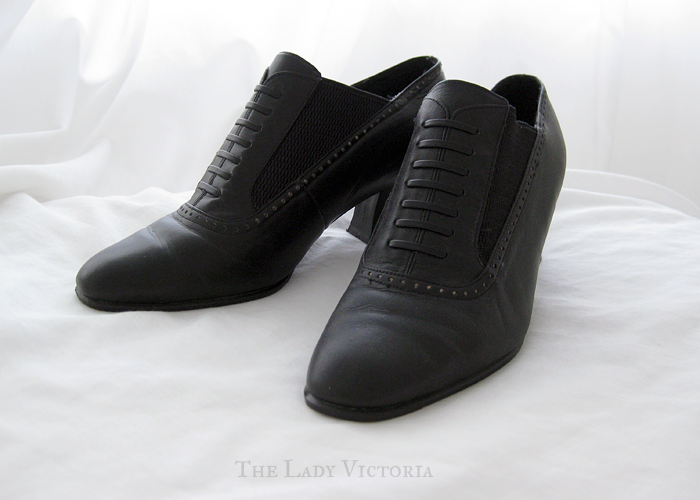 Finding a pair of shoes that look right, fit well and don't break the bank is nearly impossible. Although the wonderful American Duchess makes shoes that fulfill all three categories, international shipping is prohibitively expensive for me. The solution? 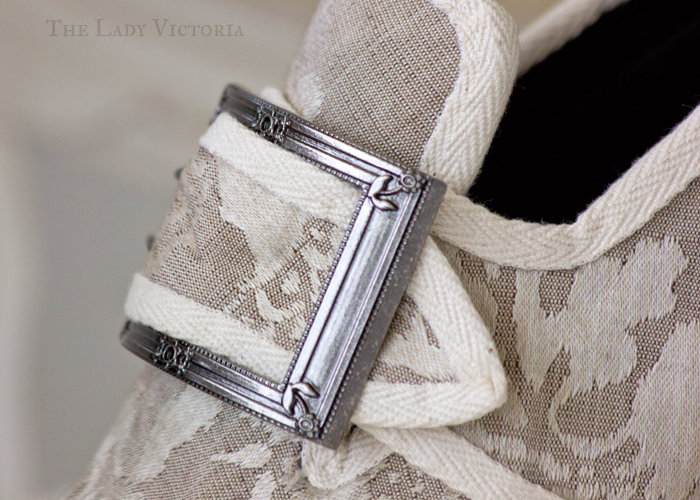 Order some beautiful shoe buckles instead and make my own shoes! Last year I found some secondhand shoes that looked like they could work. The main reason I bought them was for the heel. 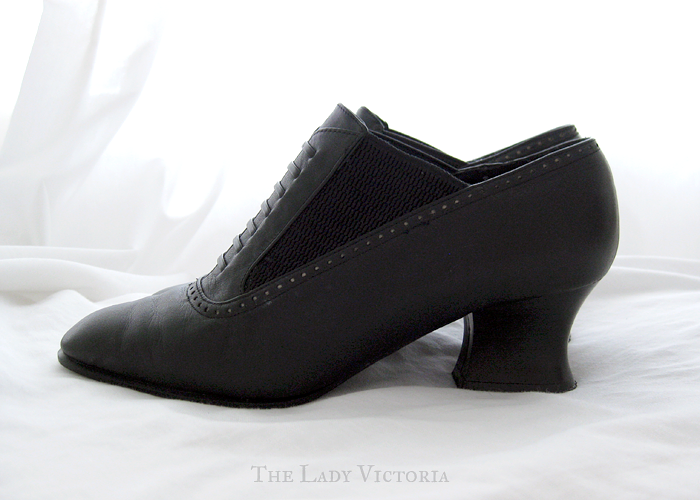 Although it's not a true Louis heel, it has some delicious curves and a great flared shape. 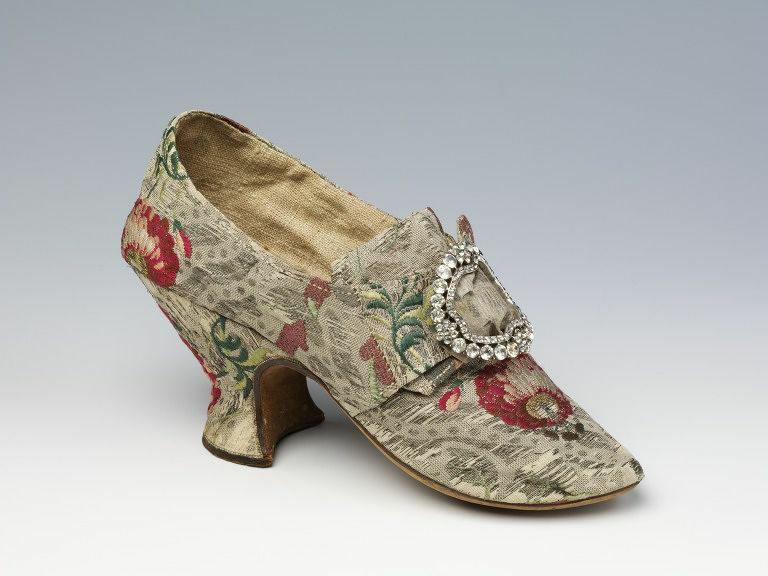 The rest of the shoe is a good shape for mid 1700's shoes, with lots of excess to work with. They sat in my study looking hideous for a few months while I searched for fabric. 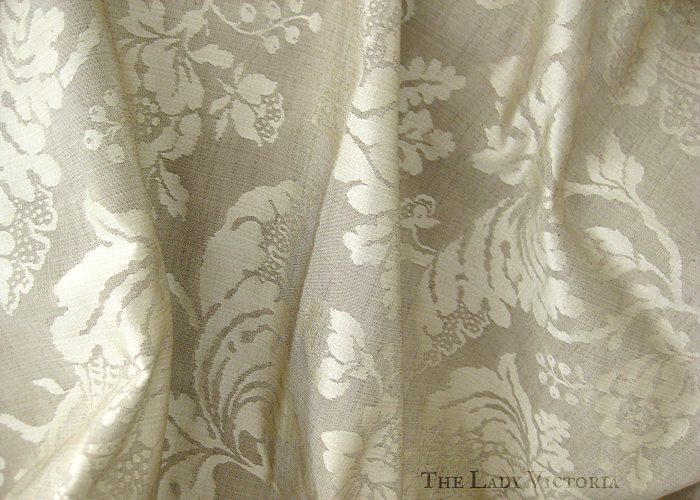 I knew I wanted a brocade or jacquard fabric in neutral, creamy colours. 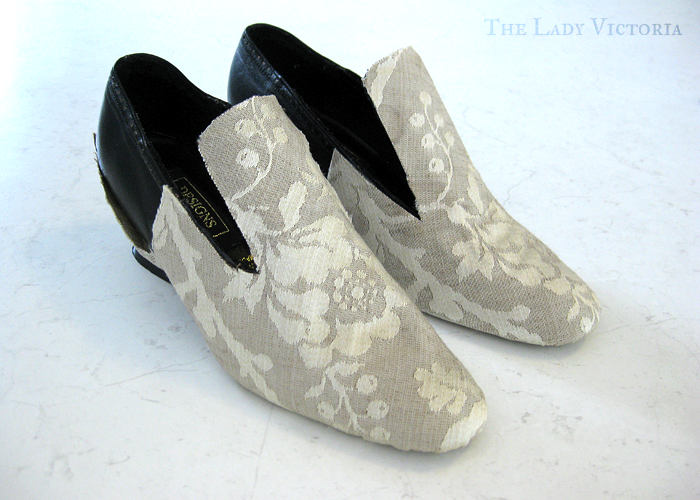 Unfortunately all the upholstery fabric I found had patterns that were too large for a shoe. Victoria & Albert Museum. 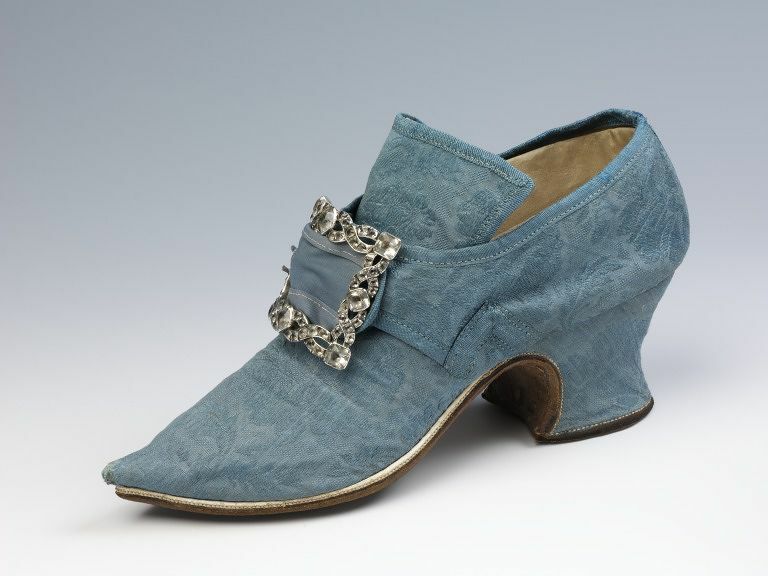 Blue silk damask shoes with latchets, paste and metal buckles in situ. Met Museum. 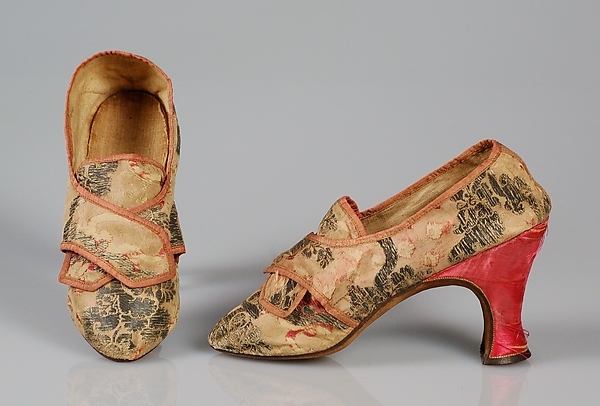 Shoes, silk brocaded with metallic thread with satin heel cover and leather soles. Victoria & Albert Museum. Silk woven with metal thread. Luckily, I managed to find the perfect off-cut of fabric on Trademe, and it just so happened to be from The Dreamstress! 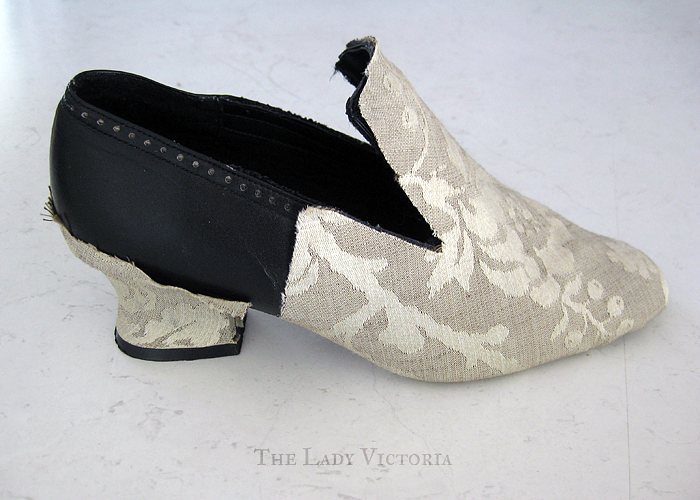 The creamy beige of the jacquard was just what I had been looking for, and the motifs were small enough to not overwhelm the shoe. 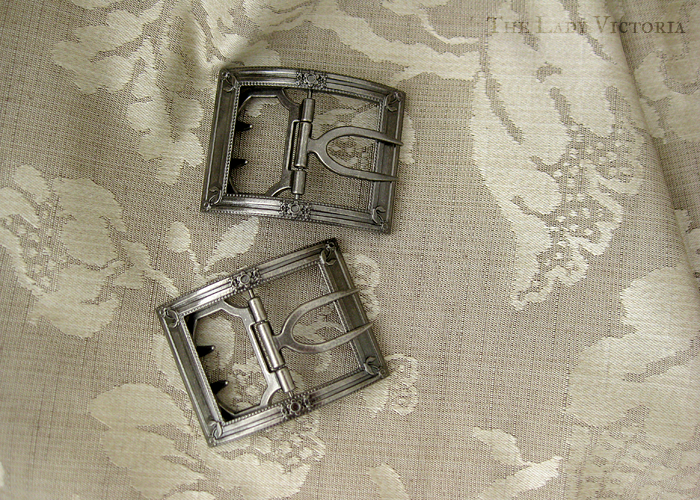 They also matched my buckles beautifully! For the construction of the shoes, I closely followed Couture Mayah's dress diary of her pink shoes. 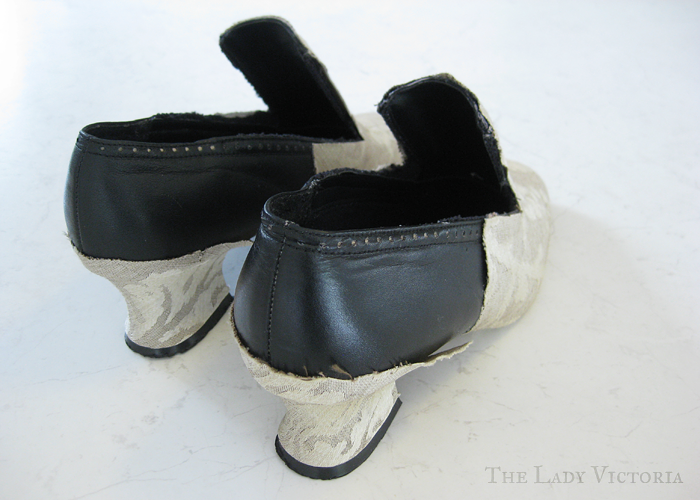 Your Wardrobe Unlock'd also has an article on re-covering shoes, which is now published for free on Loren Dearborn's old Livejournal. The first step was to rip off the sole. Unfortunately my shoes didn't have a sole that covered the heel, it was instead tucked under. 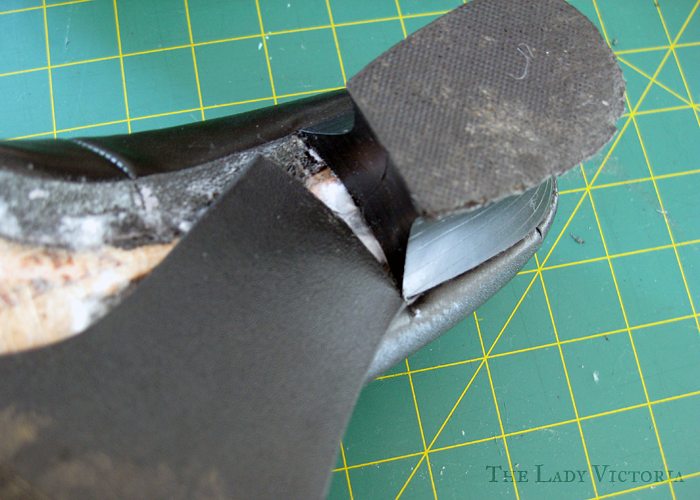 I cut along the edge of the heel with a boxcutter to get the rest of the sole off. 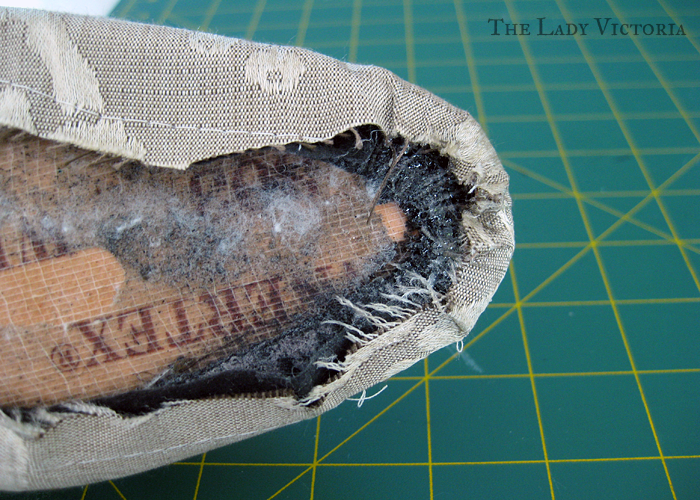 Underneath the sole was a layer of cotton batting, which was both unexpected and messy. I did all my work on an old cutting mat, since there was a lot of chopping and pulling and glue involved and I didn't want to damage the benchtop. Since my shoes were leather, there was no fabric layer I needed to peel off. I was a little worried about gluing the fabric to the leather and the bulkiness of the final shoe, but it wasn't really a problem in the end. The original shoe had some ugly elastic gussets running up the side. To make the tongue, I cut them out and pulled off the weird straps across the front. 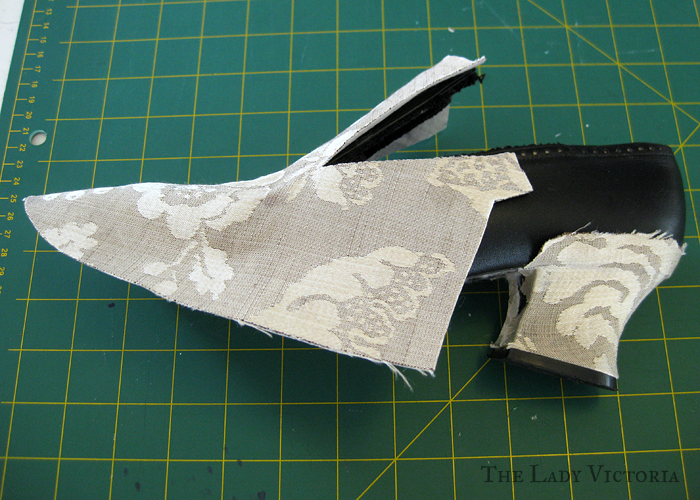 The edges of the shoe are quite thick where the elastic was sewn in, but bias binding will still fit over it fine. 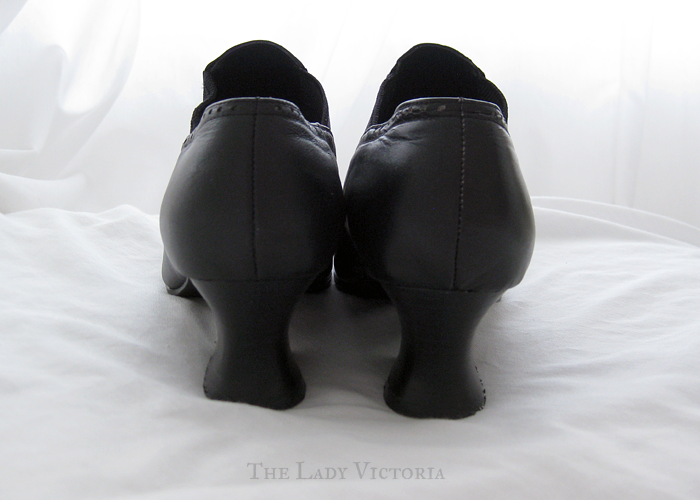 I also took off the heel tips. I didn't really draft much of a pattern for covering the shoes. 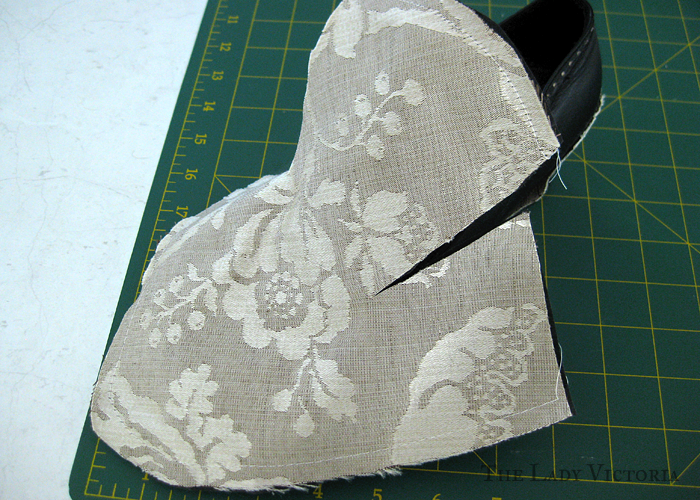 I roughly draped some muslin over the shoes before I started tearing them apart, and used the muslin shapes to cut into the jacquard. All the pieces were cut on the bias, and I tried to get a good pattern placement going. I started with the heel, the part I was most worried about. I cut out a large semi circle of fabric and started gluing from the centre back. 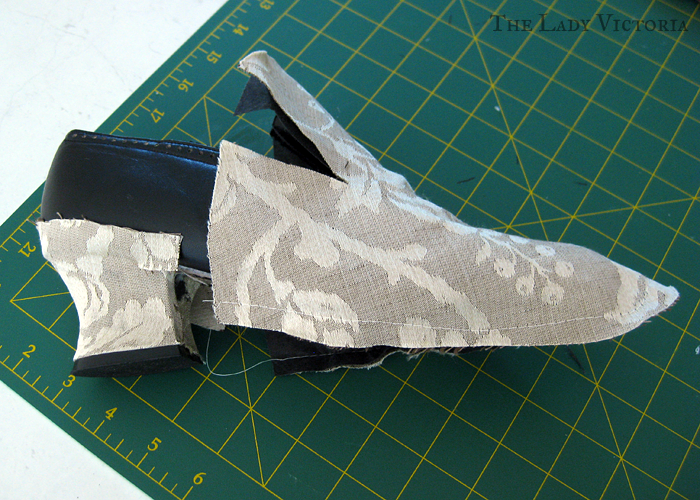 I used Shoe Goo to stick the fabric on, since it was made for gluing leather. 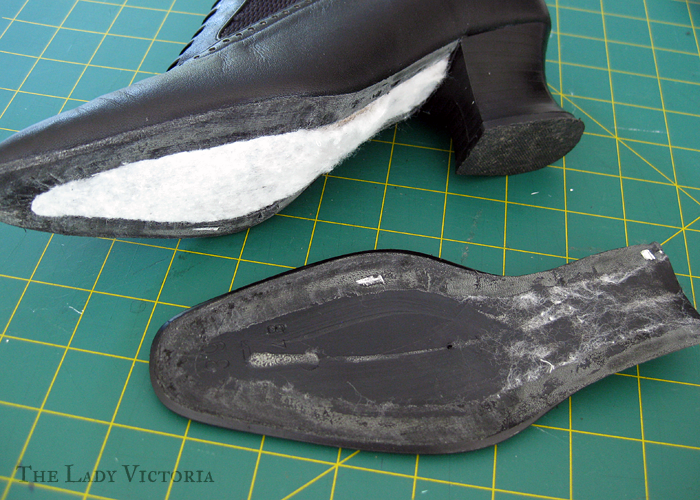 I was worried I wouldn't use the right glue and that it would come apart after all my hard work, but I was really happy with how the Shoe Goo behaved. 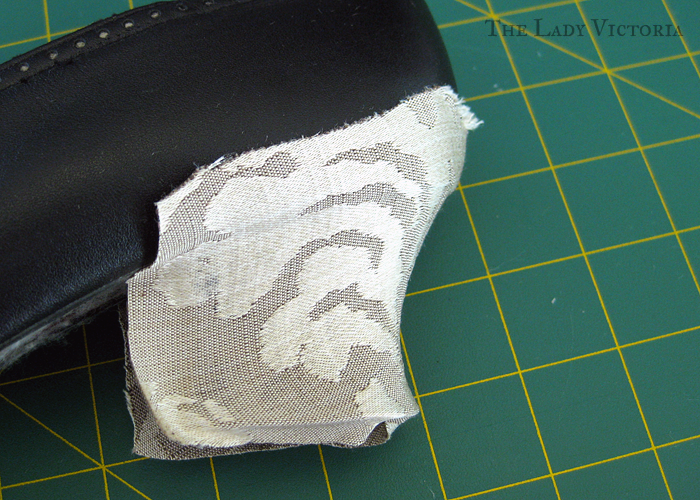 I applied the glue in 1cm wide sections, stretching the fabric over the heel before letting it set and repeating. 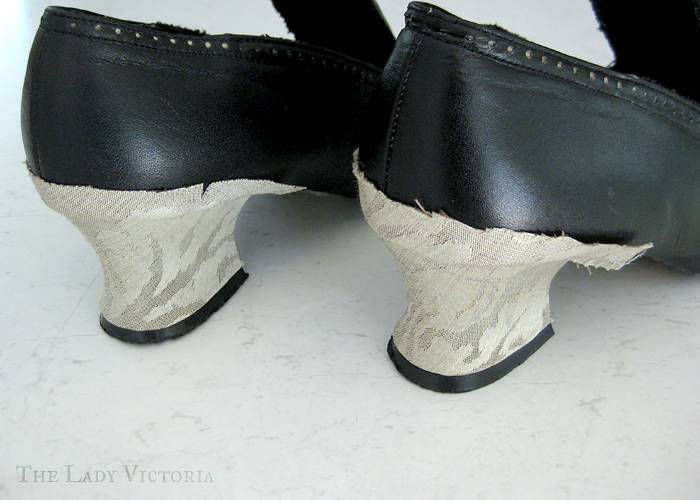 I was surprised at how well the glue and fabric responded to me stretching it around the heel. Once I had glued a section down, it stayed in place for me to stretch the next section. 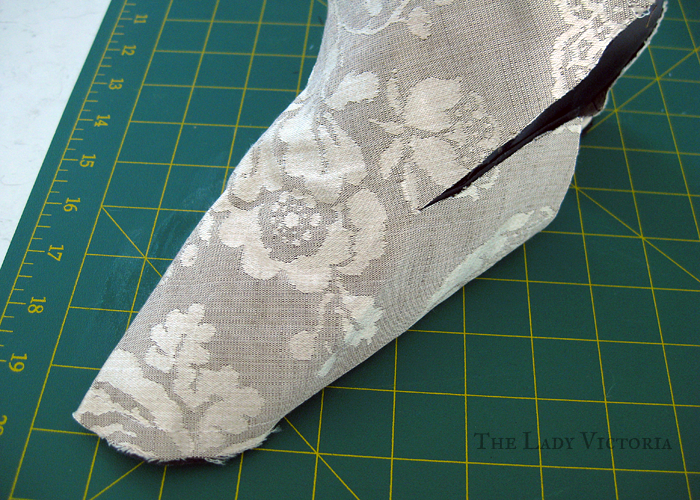 You can see in the above photo how I stretched the fabric down towards the base of the heel. The warp is barely noticeable at all in real life. 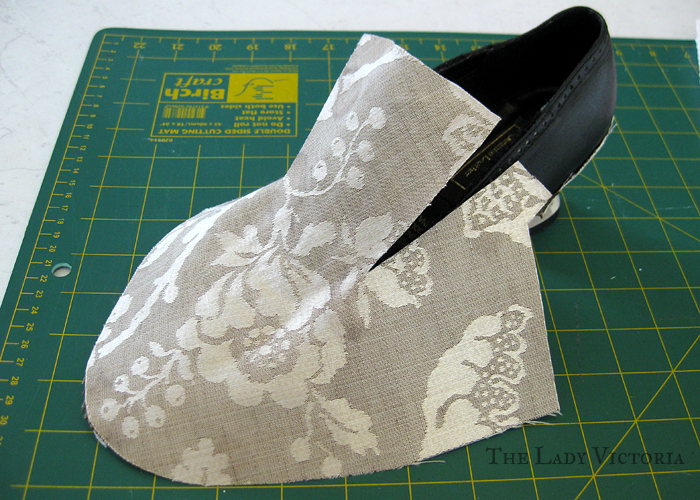 Since my sole didn't cover the inside of the heel, I cut tabs into the fabric to wrap it around. 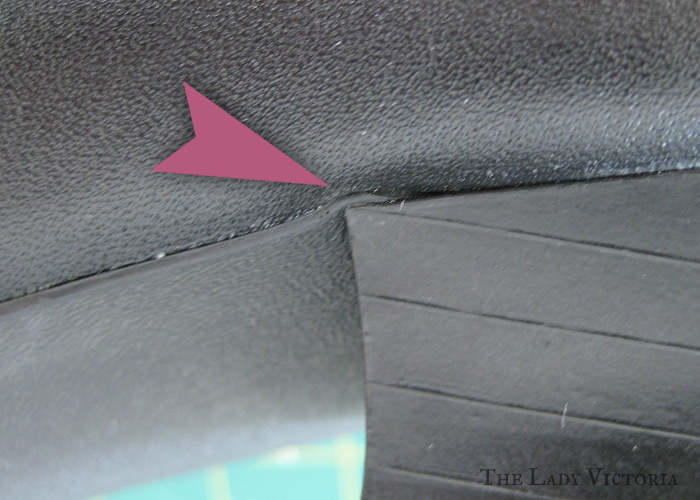 When I replace the sole at the end, i'll cover the inside with a rectangular bit of rubber or vinyl to hide the fabric. 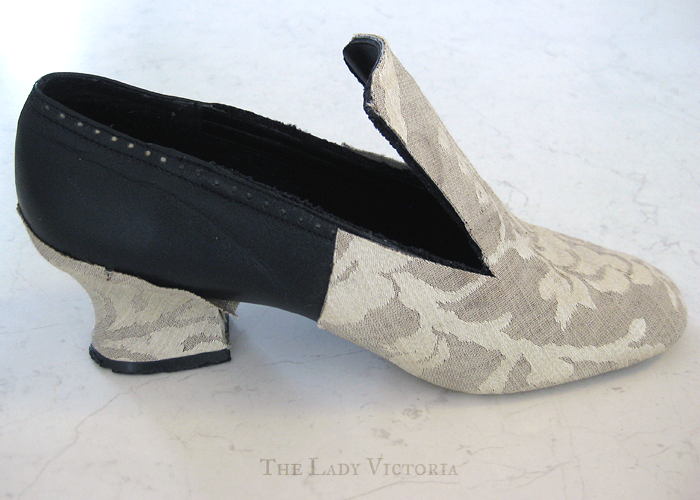 The extra fabric on the bottom of the heel was easy to trim and tuck under the replaced heel tips. 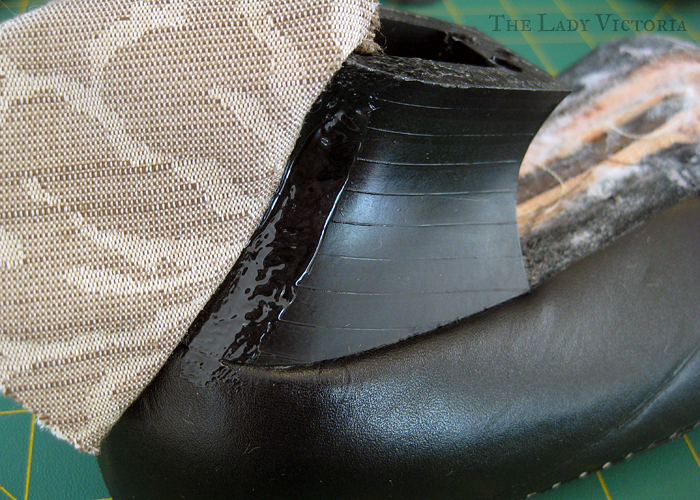 When I was gluing on the heel, I noticed that the glue seeped through to the other side of the fabric in a couple of places. I had hoped that the jacquard would be thick enough to stop this, and I didn't want to risk large patches of glue on the rest of the shoe. 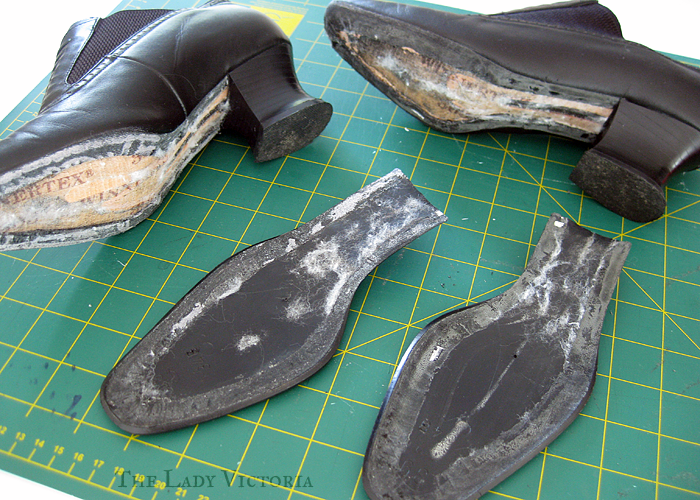 One of the heels had more glue stains than the other, so I called that one my "practice shoe". Couture Mayah used fusible interfacing to stop glue showing, but I only had non-fusible in my stash. 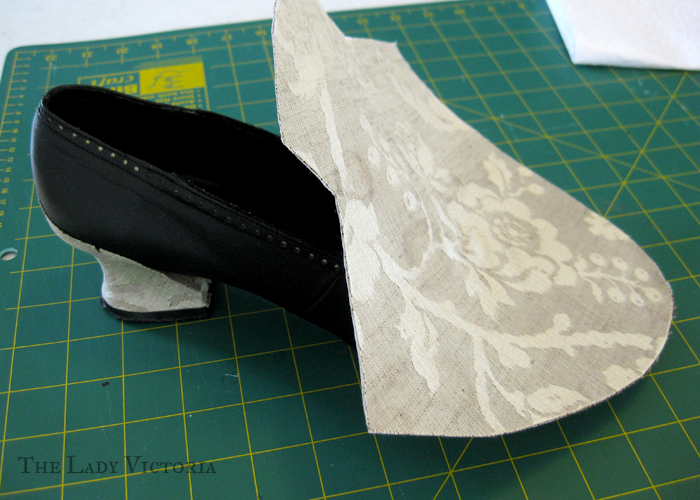 For my "practice shoe" I used the non-fusible interfacing, and it didn't go well. I stitched around the outside of the pattern piece to join the two pieces of fabric together, and started gluing from the centre outwards. Since the fabric wasn't actually fused to the interfacing, the interfacing was stuck in place while the fabric could move freely. This left the vamp with some ugly wrinking. I soldiered on, stretching the fabric as tight around the shoe as I could and trimming any excess. 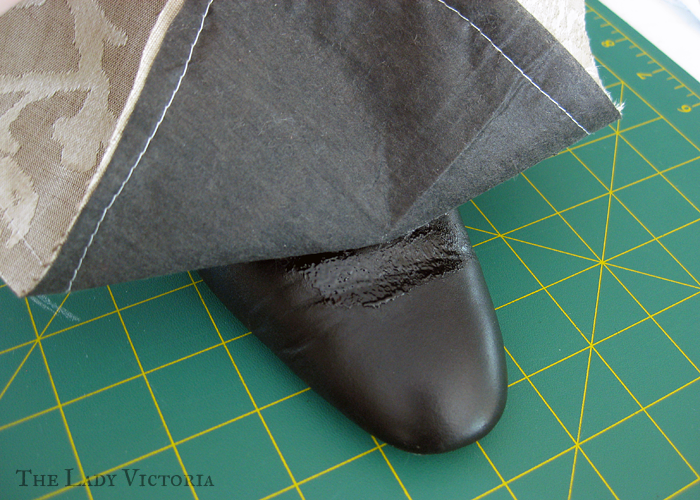 Pulling on the thread to gather the toe area didn't work, but I found it easy to fold the fabric into tiny pleats instead. 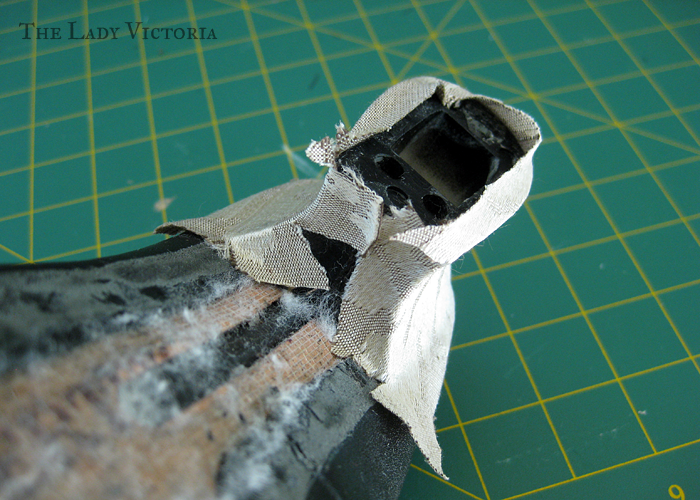 I used a lot of glue to make sure that area held, and held both pieces together while they cured. Doing the tongue was just a matter of trimming it to the right shape and gluing it down. 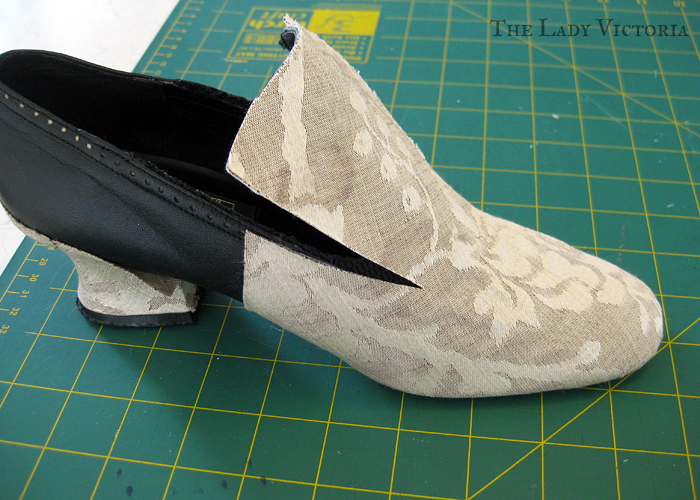 Wrinking aside, i'm pretty happy with how the "practice shoe" turned out! 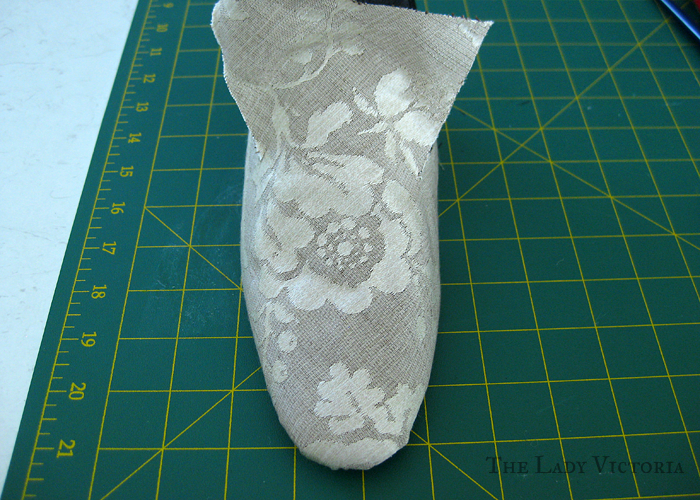 The next day I went and bought some fusible interfacing, and after fusing some to my ironing board cover I got to work on the second shoe. The interfacing made the fabric much nicer to work with, and I didn't have to worry about glue seepage. 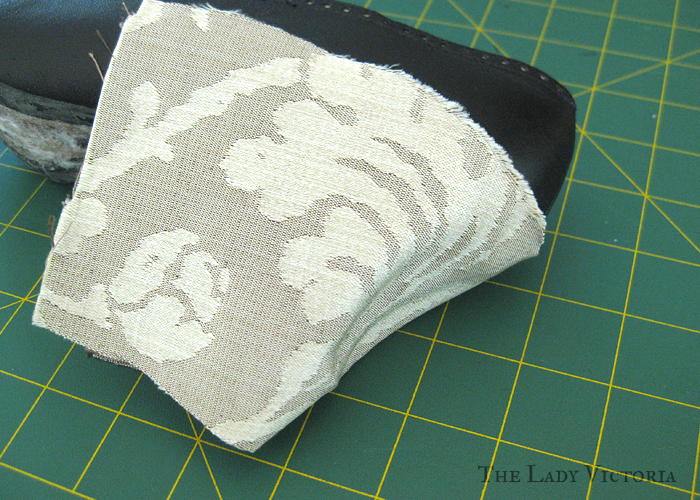 I did the front piece in much the same way, only without the stitching. It's still not perfect, the vamp of the shoe is creased from wear, which showed through slightly, and the 'decorations' on the tongue also prevented a smooth fit. 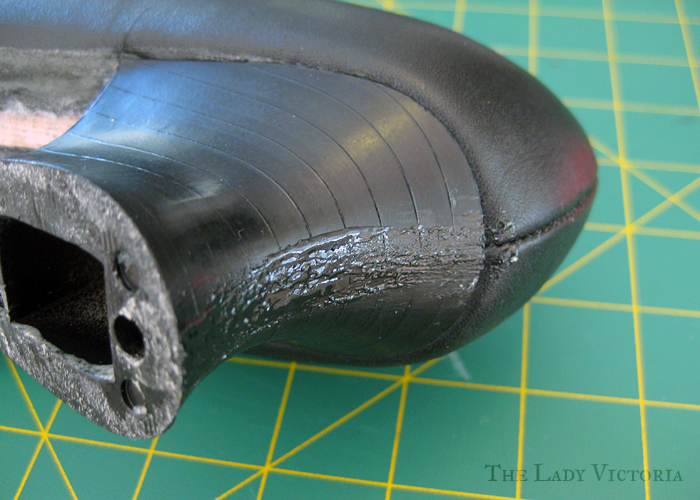 There's not as much wrinkling as the "practice shoe", as it's all glued down, but it's still not smooth. I am really happy with how they both look though, they're starting to look more 18th century and less 1980's goes Victorian. In Part Two i'll be gluing on the back and straps, and bias binding. And some more bias binding. There's lots of binding.